What Does Code P0068 Mean? P0068 means that the Powertrain Control Module (PCM) has detected an excessive degree of variation in the input voltage signal from the throttle position sensor (TPS) as compared with voltage input signals from the mass air flow (MAF) sensor and the manifold air pressure (MAP) sensor. The PCM reads and calculates these individual engine drivability sensor signals and then compares them to help develop fuel delivery and ignition timing strategy. The PCM also utilizes this information to ensure that the fuel-to-air ratio remains constant, controllable, and within acceptable limitations. If the detected voltage values of these three sensors (triangulated) fail to coincide with programmed desired parameters, over a specific period of time or engine revolutions, a diagnostic trouble code will be stored and a malfunction indicator lamp will likely be illuminated. What are the common causes of code P0068 ? The most frequent contributors to this code being set are large vacuum leaks as a result of cracked, broken, or otherwise collapsed vacuum lines and hoses. Other sources of vacuum leaks include defective intake and throttle body gaskets, EGR valve and gasket malfunctions, and vacuum operated component (brake boosters, etc.) defects. Other possible causes could include a cracked or disconnected air intake pipe, clogged air filter, a faulty TPS, MAF, and/or MAP sensor, or a defective PCM. What are the symptoms of code P0068 ? The symptoms which could accompany this code include a reduction in fuel efficiency, decreased engine performance, and significant hesitation upon acceleration. Of course the service engine soon lamp will likely be illuminated. How do you troubleshoot code P0068 ? A scanner, digital volt/ohmmeter (DVOM), and a manufacturer’s service manual will be helpful. Use the scanner to retrieve and record all trouble codes. Clear the codes and test drive the vehicle (if possible). After the initial test drive, reconnect the scanner and see if the code/s has returned. Codes that do not return are usually referred to as intermittent codes. Theses codes can often be more difficult to diagnose. Begin every diagnosis with a visual inspection of the related components, connectors, and circuitry. Components that appear to be corroded, damaged, or disconnected should be repaired before continuing with your diagnosis. Make sure that the vehicle battery is fully charged and that the battery cable connections are corrosion free and secure. Low battery voltage will skew your live test data and make a correct diagnosis nearly impossible. 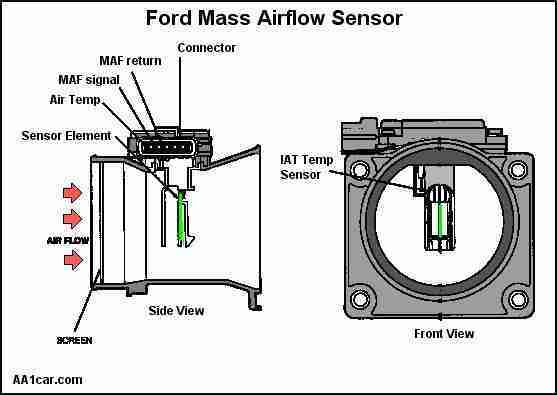 The MAP sensor (sometimes called the Barometric Pressure Sensor) is used by the PCM to detect the degree of vacuum pressure inside the intake manifold when the engine is running. The position of the TPS, RPM level of the engine, and input voltage signal of the MAF sensor are used in conjunction with the MAP sensor input signal to calculate engine drivability strategy. This sensor typically threads or is inserted directly into the intake manifold and is sealed to prevent vacuum leaks. The MAP sensor uses varying resistance to change the input signal voltage reading to the PCM. Use a DVOM to measure live data at the sensor connector. Obtain sensor and circuit resistance data from the service manual. Test sensor resistance and replace defective sensors as necessary. 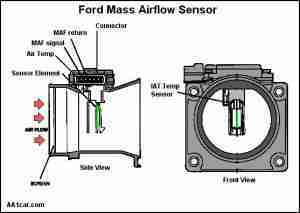 The MAF sensor is normally a vane type sensor with an exposed heated element. Battery voltage is used to maintain a high temperature across the element. As air flow increases, across the heated element, the temperature drops. This drop in temperature is recognized by the PCM as an increase in air flow to the intake manifold. The PCM uses this input data to develop fuel delivery strategy. Since the MAF reflects varying degrees of intake air, you may use the DVOM to test live data voltage readings at the MAF connector while operating the throttle manually. Measure sensor resistance values and compare them with the manufacturer’s specifications. Replace the sensor or repair open circuits and connectors as required. Modern TPS switches are of the non-contact variety. They may include hall-effect sensors, magnetoresistive type sensors, and inductive sensors. Typically the TPS is supplied with a 5-volt reference signal (from the PCM), and a battery ground. A signal circuit allows the TPS to input a voltage signal from the TPS to the PCM. The TPS is designed to provide a means for varying the voltage input signal to the PCM. As the throttle plate is opened The PCM typically receives a voltage signal that ranges between .5 and 5.0-volts. When the throttle plate is closed (at idle) the TPS is at its highest level of resistance. This maximum level of resistance means that the input voltage signal to the PCM is at its lowest possible level (usually .5-volts). At wide-open-throttle (WOT) the TPS provides its minimum level of resistance to the input signal circuit. At minimum resistance, the input voltage signal circuit will be at its highest point (usually 5.0-volts). The varying input voltage level is controlled in the same manner throughout the throttle curve and monitored by the PCM. The TPS can be tested using a DVOM and the manufacturer’s wiring diagram. Test for a reference voltage signal and a ground signal. If these signals coincide with the manufacturer’s specifications, test the input voltage signal to the PCM while operating the throttle manually. Observe live voltage data and pay particular attention to glitches and other consistencies. Refer to the manufacturer’s service manual (or equivalent) for application-specific voltage and resistance values. If all of the related sensor values comply with the manufacturer’s specifications, you may continue with your diagnosis by disconnecting the electrical connectors from the sensor/s in question and all related control modules. Failure to disconnect control modules could result in module damage when using the DVOM on the resistance setting. Utilize the wiring diagrams and connector views (found in the service manual) to perform system continuity and resistance tests on all related circuits. Circuits that prove to be open or shorted will need to be repaired or replaced according to vehicle manufacturer guidelines. After repairs are finished, use the scanner to clear all the codes and then test drive the vehicle to make sure that the repair was successful. The supercharger is designed to pump more air into the engine than it would normally use. This excess air creates a boost pressure in the intake manifold. On your vehicle, maximum boost is 12 PSI. When boost is not desired, such as during idle and light throttle cruising, the excess air is routed through a bypass passage between the intake manifold and super charger inlet.This action is controlled by a bypass valve which is connected to a vacuum source. Without inspecting the vehicle firsthand, I’m not exactly sure which part of the supercharger repair got botched, but I doubt it’s a problem with the wiring. I’d bet on it being a mechanical problem with the supercharger itself, or the way it was installed. The technician who worked on your vehicle should correct this and do right by you.